With time goes, you may find that your Windows is getting slower or running into other issues like unexpectedly application crash, shutdown or death. One of the causes might be that the Windows Registry has been corrupted or has a problem. In this article we recommend you the best free Registry cleaner and optimizer for Windows 10/8.1/8/7 –Tenorshare Windows Care Genius. While you are using your Windows computer, the registry keeps growing, so does the obsolete items in the registry. These invalid registry entries slow down your PC performance and even cause system crash. Windows Care Genius offers a comprehensive PC health checkup and optimization suggestions. You can clean out invalid registry entries on Windows; remove useless junk files, clear computer traces and browsing history to protect your privacy. 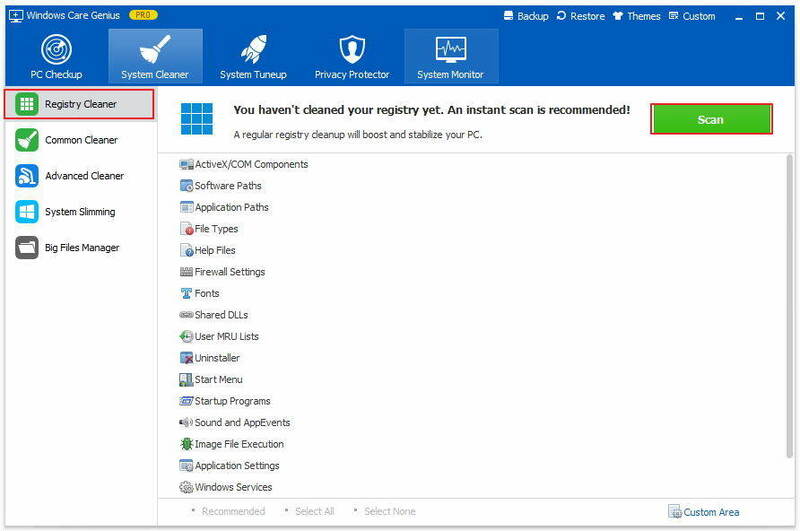 After installing Windows Care Genius to your Windows 10/8.1/8/7, follow the tutorial here to free checkup your PC health and find errors/residual items in the registry and then clean up them completely. Step One. Free PC checkup. Open Windows Care Genius, you will see a green “Checkup” button. Click it to find the potential security or problems in your Windows. Step Two. Find orphaned, obsolete or invalid registry entries. After the health checkup, you will get an index to reveal the overall status of your computer. Scroll down to invalid registry entries section, you can expand to preview details. Step Three. Optimize Windows by removing all invalid entries and other useless junk files. Click Fix button to fix all the problems. Your Windows shall be running smoother and faster after deleting these registry junk files. As a matter of fact, Windows Care Genius is a comprehensive Windows system care utility. It also allows you to perform Registry defrag to tune-up your system. In the section of “System Tuneup”, you can find “Registry Defrag”. Click Analyze button to start an analyses report. After the process is completed, you can click Defragment button to perform a registry defragmentation immediately. As a free Registry cleaner for Windows 10/8.1/8/7, Windows Care Genius can be your first choice to clean out Windows registry junk and optimize Windows system performance.